Leucanthemum (lew-kanth-ih-mum), or shasta daisy, is a genus of about 70 flowering plants from the sunflower family (Asteraceae). These clumped rhizomatous perennials, were split from the genus Chrysanthemum, because they are not aromatic and their leaves lack grayish-white hairs. Very easy to grow and will adapt to most soil types. Leucanthemums require full sun and well-drained soil to be at their best. Moist, well-drained, alkaline soil is preferred. For best results, during their growing season provide plenty of water. Shasta daisies tolerate brief periods of wet soils in the summer, but may die in soggy winter soil. Winter drainage is especially important; planting in raised beds will help to provide these conditions. Division can be done in either spring or fall, and is recommended due to this perennial's tendency to be short-lived. Deadhead throughout the flowering season, cutting the flower stems to the ground. 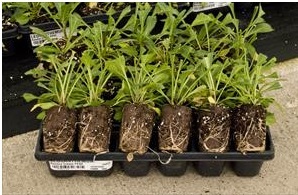 Use for edging or in a mass planting, as an ornamental, in mixed beds, for a border, and in containers. Cut flowers are long lasting in fresh bouquets. Shastas make good perennials for Southern gardens, though partial shade is recommended in the warmest zones. Attracts butterflies and rabbit resistant. Shasta Daisies are all-time favorites for the perennial border. The cheery flowers begin to appear in late spring and continue on for several months if faithfully deadheaded. Shastas mix so effortlessly with other perennials that no garden should be without them! PLANTING: Set plants 18 inches apart, in full sun to part shade. Very easy to grow and adaptable to most soil types, preferably in rich, well-drained soil. Good drainage is essential; plants may rot in too wet a soil. For best effect, plant in groups. MAINTENANCE: Deadhead throughout the flowering season, cutting the flower stems to the ground. A winter mulch is beneficial.